Far from the maddening crowds, relax in this vintage, charming two-bedroom beachfront cottage.One of four beachfront homes ideal for family reunions or small weddings. This home features a master bedroom (Q), second bedroom (2T), full bath with tub/shower, full kitchen and living room opening onto a large covered lanai. Sit and dine on the shady deck and feel the tropical island breezes. This home includes an outside Hot/Cold shower, free WI-FI Internet access, cable sports channels and HI-Def Flat Screen TV. We rented 3 of these houses our my family could attend my sons wedding. We enjoyed every bit of our stay. The houses are well maintained and the owner was readily available for any questions we had. The property is even more beautiful in person than the pictures online show. We are already planning our next trip to the beautiful North Shore of Oahu. This place was perfect place to get away from it all. If you want quiet, except for the occasional rooster, then this is the place. Great beach, sat out on the sand and did not see another person for three hours. Defineitely going back! We absolutely loved staying in this Beach Cottage. It was a perfect size for our little family of four. Our 4 year old and 2 year old loved the chickens running around. The backyard was perfect for my boys to run around and I loved that I could watch them through the kitchen window while I prepared dinner. They had an absolute ball playing on the beach. We felt like we were in heaven walking down on the beach with a glass of wine to watch them play or sitting on the porch watching the sunset every night. The location and setting was just magical. The cottage was clean and nicely decorated with all the things you need. My only suggestions would be that clothes pegs would have been handy, a potato peeler and a baking tray. The on demand options on the tv were great. We can't express enough how much we enjoyed our stay. The house is as described. Small, casual, and steps away from the ocean. The furnishings are comfortable and perfect for beach life. It's an older house with old style windows and the cupboards have a bit of a musty smell however the house was clean and the grounds well cared for. The kitchen is not stocked with much, which we expected and knew to buy ahead of time, the things we would want to cook with. We had a problem with the bathroom sink draining and the owner came over right away and cleared it for us, Thank you! Real Hawaiian experience with a great view! We enjoyed our stay while on the North Shore. The cottage is older but well kept. It has internet and t.v. For the modern amenities. The cottage itself is dated from like the early fifties I am guessing and has not been updated but gives a true Hawaii feel. I knew this when I booked so if your wanting more modern book one of the other homes beside this one. The home has a great view from the kitchen and living room and the back porch and is a short walk to the beach. The beach is rocky but great for laying in the sand and private. The cottage has no air conditioning but with the breeze it stayed cool with the breezes. I liked having a safe and also an alarm while away. You will also have roosters and chickens on the property. Apparently they are everywhere I even saw some in downtown Honolulu. We really liked the location as it was close to the Polynesian Center for the luau and show we went to. And less than thirty minutes to the Kualoa Ranch that I highly recommend a visit to. The airport and Pearl Harbor is around 40 minutes with not much traffic. To sum it up if you want a place on the beach with a great view and on the water for a great price and not expect luxury accommodations you will find this cottage is great for you. This cottage has stunning views and my small kids loved playing in the tide pools right in front. Waves were rough in October, but there are better beaches for swimming close by. 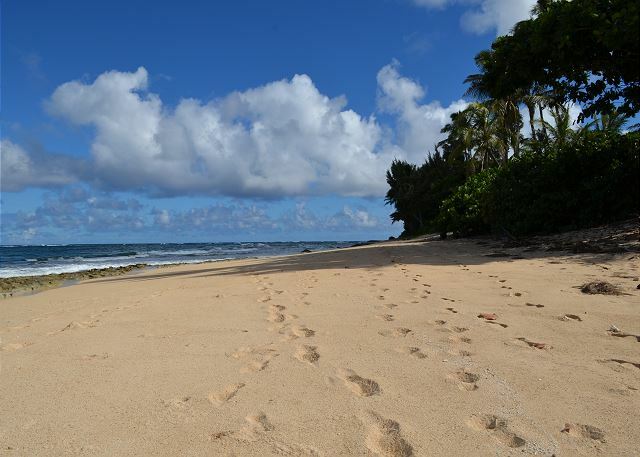 Turtle Bay resort is a minute away and it's generally a beautiful quiet side of Oahu. We really enjoyed the Waimea Valley walk to waterfall. The cottage itself had what we needed. Not a lick of food or condiments were there nor should they stay out of the refrigerator or else bugs will appear quickly, but if you go for the laidback beach style over resorts, it is an excellent choice/perfect location. There were a lot of chickens, which I hadn't expected or read anything about, but my kids enjoyed having them around. Things I wished for - beach towels (too expensive to buy there and too bulky to take back) and laundry detergent (just needed to do one load)... but overall happy and would return. Great location, good layout, no aircon but no need as great breeze through house when windows open. Windows old style timber but easy to open once you got used to them. Highway noisy at night, busy on weekends. Bathroom door could be difficult to open. Only 2 wineglasses provided. The address that was given took me to Kahuku, which definitely was not the location of the beach house. I tried to call the emergency number that was provided and left a message and got no call back at all. Luckily, my other half is familiar with north shore and Kawela Bay that he parked in the side and had to walk on feet to each house to see which one it was and that’s how we found it. When we got there everything seemed fine however, there was no rice cooker, which on the website it says that they have that essential in the kitchen. Also, the bathtub was clogged prior to us and it took a long time for the water to drain, which in turn caused us to make the showers quick because of the water kept running it would overflow because it could not drain fast enough. Other than that everything turned out very nice. I do wish there was more privacy between neighbors. This property was just what we had in mind, a small place for the 2 of us so we didn't have to stay in a busy hotel. It's a little rustic and there are a few repairs it needs (the sliding closet door was off its hinge and the screen for the patio door was torn) but it is a good solid house and everything works fine. Nice washer/drier to keep your clothes clean. Best of all, beautiful view of ocean waves and stairs down to nice quiet mostly empty beach. It does have a second bedroom with 2 twin beds for children. Everything is clean and cozy, would highly recommend! Great home if you want to be away from everyone. I went out the last morning we were there for a little over an hour and saw 1 person. I liked that. The home is cute like the pictures show. The lanai overlooking the ocean is great! Lots of seating and comfortable. TV, DVD player, and kitchen were very good. The beds were comfortable. The lack of ac was only a problem b/c when leaving the windows open at night, both bedrooms are facing the street. There are trees that block the view, but I wish that we could have listened to the ocean. Loved the farmers market just north about 1/2 mile. Close to many other great beaches. We had a classic beach get away and thoroughly enjoyed our "relaxed" holiday on the north shore. my daughter,granddaughter and I had a girls vacation and had a great time there very relaxing just how you expect a beach house to be a little rustic not like those high end dollars ones after all your there to enjoy the outdoors not stay in the house. Great compound and even better customer service. The Team at Team Real Estate follow thru on everything they promise and some. Gracious and flexible. It's a great location to get out of the hustle and bustle and just relax in the tranquility of the North Shore. The house(s) are exactly what you'd expect from a North Shore house. Don't go in expecting luxury, use your rational expectations. The places were great. Nothing fancy, but well-maintained and clean! Lovely view of the ocean and even a surf break out front. We sat and watched whales each morning while sipping coffee. We used two out of the three houses we rented for our wedding and it was magical. I came here with my family of four. My husband and two kids (18 & 20 years old) and we felt at home the whole time. Not a lot of ammenities, but had everything we needed. We were watching whales from the patio! Great view of the sunset, shared beach access with neighbour. Clean and well kept, and roosters to wake you up early every morning. The only issue is our flight arrived quite late, and the place was very hard to find! No house address on the outside of the gate, and we had to take an educated guess on which one of the four houses on this property was ours. Added an hour to our travelling time, but i'm sure its easier to find in the day light. Walking distance to amazing beaches. 10-30min drive to any grocery or convenience store. All and all, great experience and will consider this small property again in the future. I could not have been more pleased with this little gem in North Shore. Team RE was flexible with our arrival and departure dates and were very concise with after hour key arrangements and communication. I noted that there was no AC when considering this property and the weather was very hot while we were there. There are great Windows ceiling fans and the trade winds that cooled the home quickly when we returned from a day of excursions. Though we remained on Oahu for a few more days, we were sad to leave this quaint bungalow when we departed. We loved it and wished we stayed here longer. I have already recommended this to others. Beautiful house in paradise. 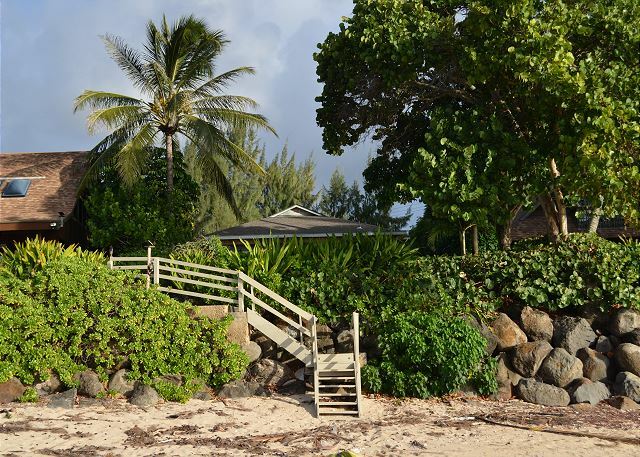 Great outdoor showers and beautiful beach almost private right in front of the house. Wonderful experience. -all the very basic amenities provided and clearly described. Make sure to pick up any extra cooking items such as spices, oils, aluminum foil, etc. It was very helpful that it had beach towels and laundry machines (make sure to bring detergent). -Would highly recommend this property to anyone! Thank you for such a wonderful stay! We also rented the house next door and between the two properties our group was very comfortable. The views were incredible and the beach was like no other. Even in the high surf time of the year the beach was usable most of the time. The property is convenient to local stores and markets so we didn't have to travel a whole lot to stock up on groceries for the vacation. The house was very cozy and clean. We didn't experience any problems with this house but had a problem with the TV in the adjacent house and the property management team resolved it very quickly. I would definitely stay here again. Far better than staying in a hotel and sell expensive for our group as well. Great job Team Real Estate, thank you for accommodating our reunion so professionally. My husband and I rented out all four houses for our beautiful wedding. Our family who stayed in the venue enjoyed this beautiful home. The property was well maintained and clean. There is not a big swimming area, unless you do not mind swimming in the tide pools or walk a little down the beach to a little sand spot, but you can also tan on the property or on the beach (if there is not surf). Looking for something small and quaint on the North Shore this is the property for you. This was my second stay at the property and I was just as happy as my first visit. Nothing had changed from my previous visit of five years ago which was perfectly fine for me, the North Shore is supposed to be the old country feel and not the hustle and bustle of Waikiki. If you are looking for ultra modern and amenities the North Shore is not for you but if you are looking for something quiet and a low key getaway this is the place for you. I just can't wait to visit again. We had a great vacation in this cottage. The location is fantastic and the view of the ocean is amazing. The beach out front was too rocky for swimming, but there were great beaches a short drive away. Despite some crazy happenings - none of which were the fault of the management company or the owners - during our stay, we really enjoyed our stay and the homeowner was wonderful!! The master bedroom ceiling fan REALLY needs attended to as I am not the first to mention it and someone needs to get on the "cleaner" to put a good scrub on the shower/tub - not that I thought it was filthy, but there is a build up that could be eradicated. The home is functional, showing its age, no frills with views to die for and a a laid back, relaxed, easy North Shore vibe. We wanted a basic place where my wife and I could kick back and savour the trade winds, the beat of the surf, take some beach walks, cook for ourselves when we felt like it but near enough to town to go out and eat or shop if we needed to. This place met all of those criteria and more - if you want luxury, this isn't for you but we absolutely loved it! Halewa is a short drive away to shop, eat out and get the basics at the supermarket and between the house and there are so many famous and wonderful surf hang outs. We miss the Noth Shore and the laid back pace of life that this property exemplifies every day ! We rented the house for a week since a friend of ours was celebrating her wedding in another house on the property. Everything was just abut perfect. Great location, a short car drive to supermarket and gas station. Lovely beach front that we used a lot. You are a short drive to lots of beaches and different touristic spot. Increidible romantic amazing place and people...missing already this paradise place and wish being back soon!!! We have visited the north shore, renting properties many times. This little hale is a great spot! It's right on the Kam but the wall keeps the road noise down, and the grassy lawn leading right to the steps to the beach is amazing! The home itself is old and the furniture is dated but the view is fabulous and you'll spend all your time on the lanai anyway. The property is well maintained and the home is clean. The kitchen is stocked with a good number of dry goods (left behind by other visitors) and utensils/small appliances. Stop by the house before you go to the store so you don't waste money on things you don't need to buy. 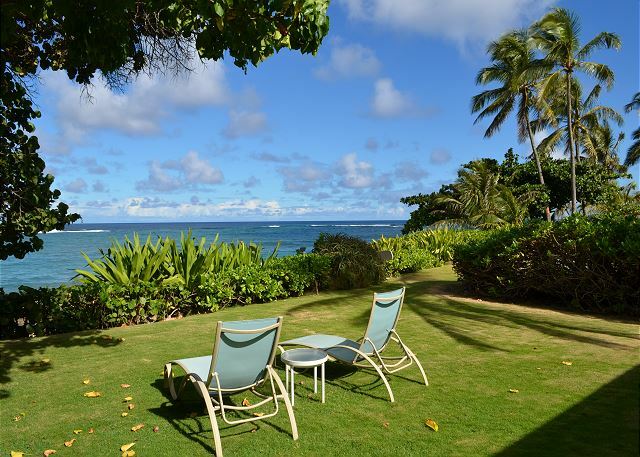 This is a great North Shore location, near Sunset beach and Keiki Beach and about 15 minutes to Haleiwa. Food Land is about a 10 minute drive. Sharks Cove has great snorkeling. It would be nice if the property management company would put a lock box on the house so you could go straight to the house. We had a very hectic couple of weeks leading up to this trip and I made the mistake of not having the instructions for the key pick up with me when we landed, so I had to call the office from the car rental parking lot. It was a fairly simple problem, they email instructions and I didn't get the email. Instead of kindly just sending the email again, I had a 13 minute phone conversation with 2 different agents at the office questioning me about why I didn't get the email. I seriously started to wonder if I was going to have to find another place to stay, but she finally sent the email and we had no issues from that point on. It was a frustrating start to a vacation we worked very hard to have! We would love to stay here again. This time I know how their key pick up and drop off works so I would be prepared. Kawela Bay was the perfect place to do nothing. We will be back for sure! Cute home with everything you need for a relaxing vacation. I called this our rustic cottage while visiting the North Shore. Can't beat the view. However, some things like working plugs, especially in bathroom would be nice. The fan in the master bedroom could not be used due to rattling, and boy did we need the fans going. Thankfully a few fans found in closets. If you like to cook bring your own knives and a few spices from home. Nice to have the deck with table to sit outside. Bring something for the Mosquitos outdoors. You'll want to be outside as much as possible and in the eve need the spray. The mgmt co did provide clear instructions and easy to drop off keys. I do recommend this rental if looking for some rustic charm while visiting the North Shore. Beautiful location. Older property, interior is not updated. Beds were comfortable. Furniture was not very comfortable. Road noise at night and on ocean side. No air-conditioning but all the fans worked. Outlet in the bathroom still didn't work. We had a wonderful stay on the North Shore and loved the house we rented. It was clean, great location, and had a million dollar view. We loved being able to walk to the fruit stand that was about 1/2 mile away and just a short drive to Sunset & Waimea beach. The outdoor shower was one of our favorite things but we would have liked it to be enclosed. It's too hot to shower inside and the outdoor shower would be nice if it was private. We would stay here again. A great spot to get away from the crowds on north shore. The beach gets very little use except by some local fisherman and those who live there. The snorkeling is great as long as you know what your doing. There is a nice sheltered area a couple hundred yards to the west if you are new to snorkeling or have small kids. The time of year we went (may/june) the beach in front of the house is rock and coral but there is plenty of beach down in either direction. If you are 100% about nice sandy beaches then I would steer you somewhere else. We cooked 90% of our meals and the kitchen and the weber were well equiped for everything we made. Again, if you are looking for a different 5 star restaurant every night then north shore isn't for you. The backyard and covered deck is to die for. Part of it gets shade all day which is great if you dont want to be in the sun all the time. The yard and plants are beautifully maintained, it looks nicer than a golf course. Over the past years we have rented 3 different north shore beach houses and the family agrees that this is thier favorite so far. It is a great location and has a great view. Sandy beaches are about 100yards in either direction. It's in a good location on North Shore. Beautiful Spot & Great Value!! This is the perfect location on the North Shore. 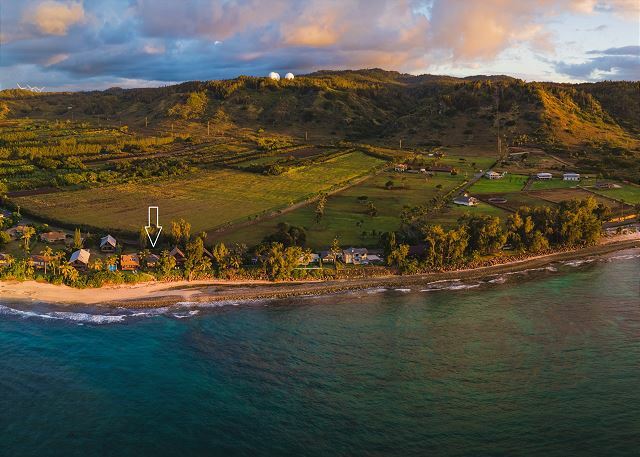 Away from the bustle and busy-ness of the Sunset Beach and Haleiwa areas, but just a short drive from everything you could ever need. 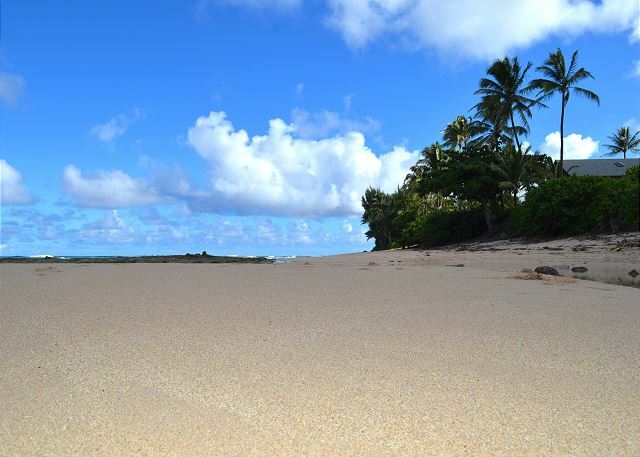 Turtle Bay and Kahuku just a few minutes up the road, and Kawela Bay (perfect, calm beach) just a short drive/ walk as well. I will stay again, and will be recommending to my family and friends. This house is on a rocky beach – so not great for swimming, but beautiful and fabulous for long walks. The house itself is a bit older/ run-down, so don't expect luxury. Also there is some road noise that can be heard from the bedrooms – I am very sensitive to road noise, but I slept with the bedroom windows closed and the sliding door open to hear the ocean, and all was fine. The only suggestion I have is for the owner to get a couple beach cruisers for renters to use – it would have been so fabulous to be able to ride to the nearby beach, fruit stand, or Turtle Bay. Also, the Wi-Fi was spotty during my stay, despite rebooting the router a couple times – not a big deal for me, but could be annoying for those trying to get some work done while at the house. Kathy at Team Real Estate was very responsive and helpful. Overall a great trip! Bring your own knife it you are any kind of real cook. Otherwise everything was just fine. Great location and incredible ocean view. New door mats (this century) would enhance the keeping of floors clean. Must be an ocean front thing. The place we stay at in Mendocino County Ca has the same 30 year old mats. Loved the old wood windows and original wood walls. Whales were quite active in March. Could see them out past the reef all day long. Overall a great experience. Could have used more details on current amenities of the home, no blueray player, dvd instead, no power in bathroom, and no numbers on stove controls. Perhaps having a detailed list in the home, operating instructions and switch locations. Had a wonderful time. Would recommend to anyone wanting a relaxing vacation. Aloha ! 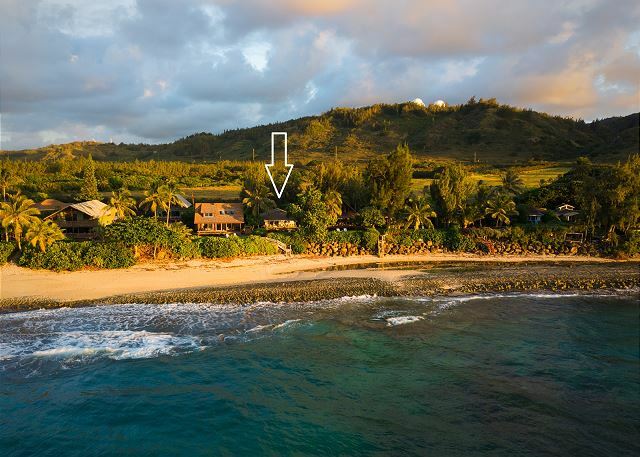 Fantastic location on the North Shore, with a large covered lanai overlooking the ocean and perfect sunset views, just steps across your lawn to get to the beach. A short drive to Foodland and Haleiwa beyond, even closer to the Kahuku food trucks and restaurants and the Turtle Bay Resort, not to mention a good roadside fruit stand just two minutes up the road. This cottage made a perfect home base for exploring the island, and we would definitely stay here again the next time we are on Oahu. I would have liked to have had a broom & mop and a decent set of knives in the kitchen. Especially when you stay for a week or more you can use those stuff. PS: Kathy Sanders from Team Real Estate Inc was wonderful: she was very helpful courteous and professional. I saved for 10 years to take my wife to Hawaii for the honeymoon we never had. Now she wants a one way ticket back. Rental exceeded expectations. Terrific location and staff very helpful. Would highly recommend to anyone to avoid Honolulu traffic and tourist traps. We rented all four houses and accommodated a large group of friends from all over the US. Everyone loved the location- so close to the beach,and all day and night views of the water and clouds. I haven't had that much relaxation and fun in years. Our family spent 7 nights and had a great time. The house was a great fit for us. There is three in our family. The ocean is right out side your door and down a flight of stairs. It is a rocky beach outside the home but there are some great beaches extremely close that are an easy drive. We enjoyed the North shore and the east side. Much more quiet then Honolulu. Ted's Bakery is just a few miles away. They have some great food. The property management team was great. They did respond to your needs whenever needed. The kitchen could use a few more pots and pans. The home had everything we needed otherwise. We thoroughly enjoyed our experience at our rental home. It was very clean and well maintained. The only small issue was the doors to the bedrooms were very tight and it was tough to open and close them. It was in a beautiful location and convenient to everything. We loved it!! The perfect stay for our family! We rented out all four houses for our wedding and the property was absolutely amazing. We stayed in the smaller 2 bedroom cottage which has the typical charm of a north shore house. The house came clean and had nice amenities including a flat screen TV but we never watched it considering the view is amazing. I would recommend these houses to anybody wanting to get married on the North Shore. The staff was always helpful and the price is on point. I'll be sure to return here for an anniversary! There is a reason they call it paradise! Showering outdoors every morning at sunrise while watching the surf....doesn't get any better than that! I loved this house! It was so perfect for my stay with my brother. It was very hard to go out 'sightseeing' as heaven was on the door step, To wake up each day to an amazing view of the ocean was priceless, and the sunsets each night was nature at it;s best. Mahalo for sharing your home. Nice ocean view. Unable to use beach because of all the rocks. Quaint cottage - needs some fixing. This is the second time we have rented this house. It was cleaner this time. We had only one extra garbage bag and only one extra roll of toilette paper? But we shopped before we got there and got extra supplies. We arrived in the dark and if we didn't know about the house in advance we would have been in trouble trying to get in since there was no lights on and the sensor light in the back of the house didn't work. They say to use the alarm when leaving the house but when we left and tried to set it, I couldn't get it to set. The queen bed in the bedroom looks like a new mattress and looked comfortable, but we didn't use it because the out door lights from the neighbors house was so bright and shined thru the curtains, maybe could use some new curtains that block outside view too. The original windows in the house are cool and allow allot of air in, but the windows in the front don't lock? Alarm with windows that don't lock? Wi-Fi and TV work nicely even though I didn't use it much. Spent most of the time on the deck and on the beach. The rental price is good for the area and we will probably use it again - why not - it's paradise! We so enjoyed being able to walk out the back door and right down to the beach. The tide pools were perfect for our grade school aged children to play and explore in. The rental was conveniently located to everything on the north shore as well. I found myself truely relaxing there. The beds were comfortable, and the high ceilings made it feel very spacious. We enjoyed the outdoor shower too (but it would be better if it had a privacy screen). Everything we needed for a great vacation was there! We love the location of this beach house; just a few steps and you're on the beach, beautiful view for watching whales and sunsets. The house is clean and cheerful, but the bedroom with twin beds had an odd smell and the beds could be upgraded. All in all, a wonderful experience.